MELBOURNE, AUSTRALIA: 83 year old Yoga instructor, Bette Calman, performs some Yoga moves on the 22nd April 2009. At 83 Bette Calman is still practicing and teaching Yoga, teaching up to 11 classes a week. 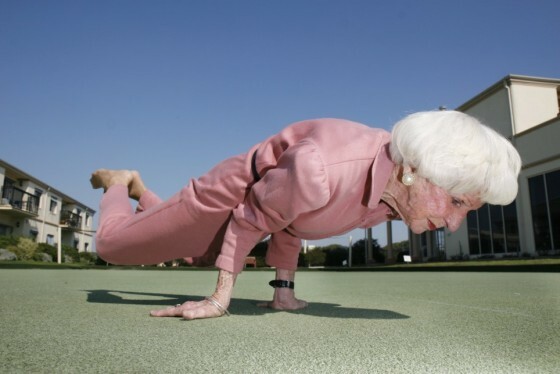 Bette has been practicing Yoga for over 40 years, and has no intention on stopping anytime soon. To Bette age has nothing to do with living a healthy life. “I didn’t realise I was nearly 80 until my 80th birthday.” Bette moved to Melbourne 8 years ago with thought of retireing, but found her self back in action after her daughter Susie, who is also a Yoga instructor, was pestering for fill-in teachers.